Deep groove ball bearings are suitable for moderate radial or thrust loads and combined radial/thrust loads. 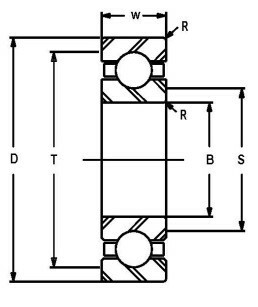 The metric DGB series follows ISO design practices for boundary dimensions, Bore, O.D., width and corner radii. Both metric and inch series bearings are supplied with a two-piece machined brass cage, ball centered in most sizes and land riding in the very large bearings. Unless otherwise specified by the end user, these bearings will automatically be supplied with a C3 clearance for metric bearings and B3 for inch series ball bearings. This is necessary to provide some mounted clearance since these bearings are typically mounted on a shaft with an interference fit. Please refer to our engineering section for tolerances, internal clearances, and recommended shaft and housing fits for these bearings. Because of their versatility, deep groove ball bearings are used in many applications throughout multiple industries in electric motors, pumps, gear boxes and rolls. American Roller Bearing’s brass cage and heavy designs are well suited for these tough applications. We offer deep groove ball bearings from 8”/200mm bore to 63”/1600mm bore.